marie: this is not my house. this was taken from my house, though. it's the view from my bedroom. and seeing that one definition of pastime is "something that serves to make time pass agreeably", i guess that would qualify time spent in bed napping/relaxing/reading/editing/daydreaming of my baby as a pastime of mine. it's very agreeable, and a good deal of the third trimester has landed me here. so in case you were wondering, that is the connection between my neighbor's roof and this week's theme. naomi: this is what makes my time pass agreeably. 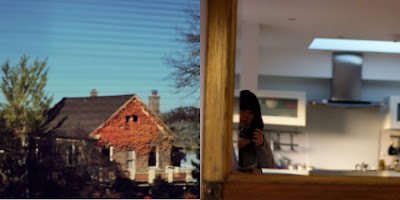 exploring other peoples houses and taking pictures in their mirrors. next week's theme is bokeh chosen by london town.